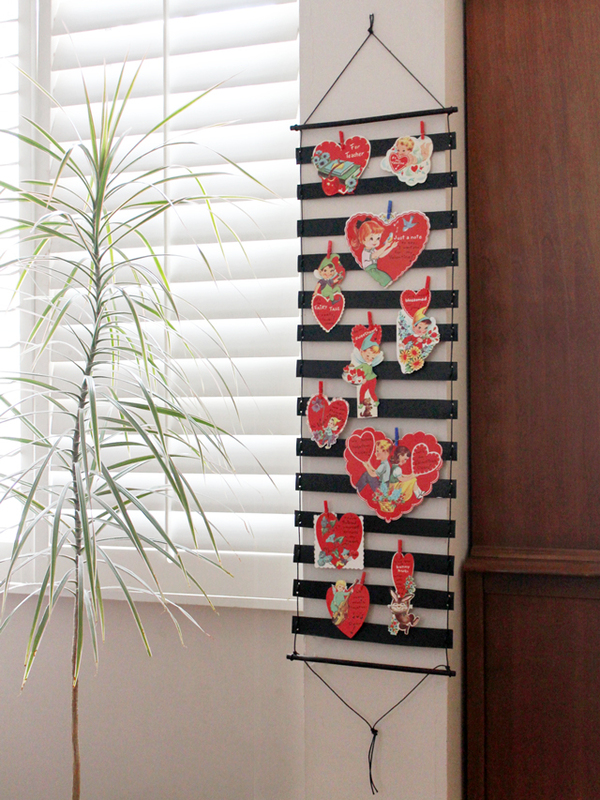 I thought I'd show you how I reused the Greeting Card Wall Hanging Display that I made at Christmastime, to make a Valentine decoration. 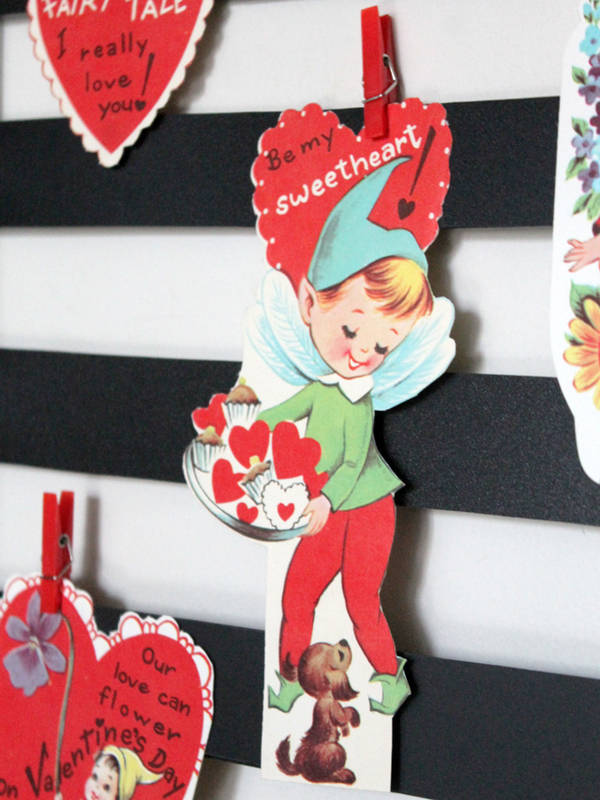 First, let's talk about the vintage valentine cards that I hung on it. Were any of you using eBay back when it first began? If you did, you'll recall how there were lots of awesome vintage finds to be had, at very reasonable prices. It seemed at the time that most sellers of secondhand goods were more interested in cleaning up and finding new homes for the things they no longer needed, than they were in making a lot of money on the site. Oftentimes, they'd bundle up all that they had of a certain item, and offer the whole lot at a very reasonable opening bid cost. This made for some awesome finds for the vintage loving buyers that used the site back then. There were so many people selling excellent things, and relatively few people confident enough with online shopping back then, to take them up on their offers, resulting is terrific vintage buys. I began using the site/service in the early to mid-2000s. Being newly-weds on a somewhat limited budget in those days, I was primarily looking for things that I could find to furnish our home, that cost less on eBay than comparable items found in regular retails shops did. The cherry-on-the-sundae was that the things I found were vintage, and therefore beheld the charming good-looks and quality that accompanies items manufactured in the fifties and sixties. I especially appreciated that many of the vintage finds were in like-new or unused condition, and I assembled a lovely collection of tea-towels, tablecloths, blankets and bedding, kitchenware and home decor, which we now use everyday. Another category of finds that I sought out on eBay was all manner of stationery. Being an avid user of snail-mail, I looked for vintage greeting cards that had not been previously written on. Entire boxes of Christmas cards from the 50s could be found for about $10, and unique birthday cards for under $1 a piece, so I began collecting these paper-goods, initially with the intention of actually using them. And at first, I did send them off to friends and family, but then began saving them because I loved how the old cards looked, appreciated how impressive it was that these pieces of paper had been preserved for over 60 years, and found that I couldn't part with them. 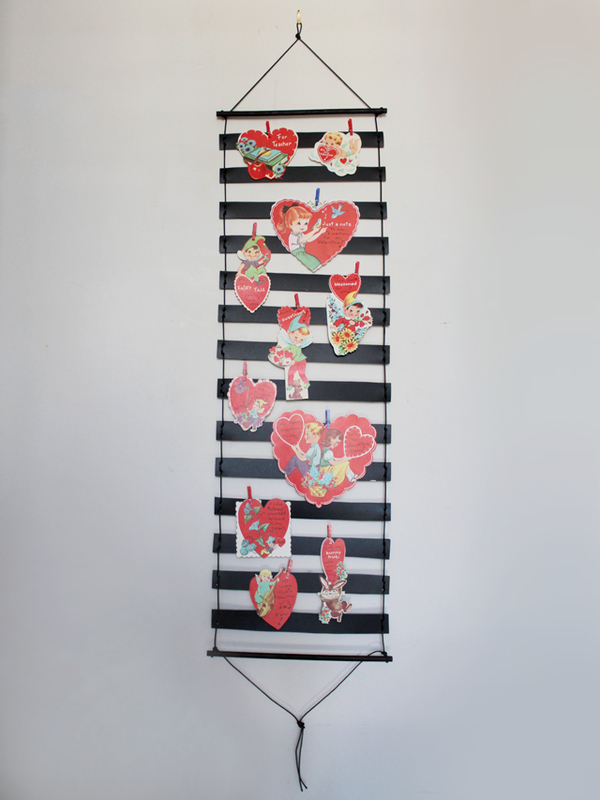 This brings me to the Valentines that I used to create this wall hanging decoration. 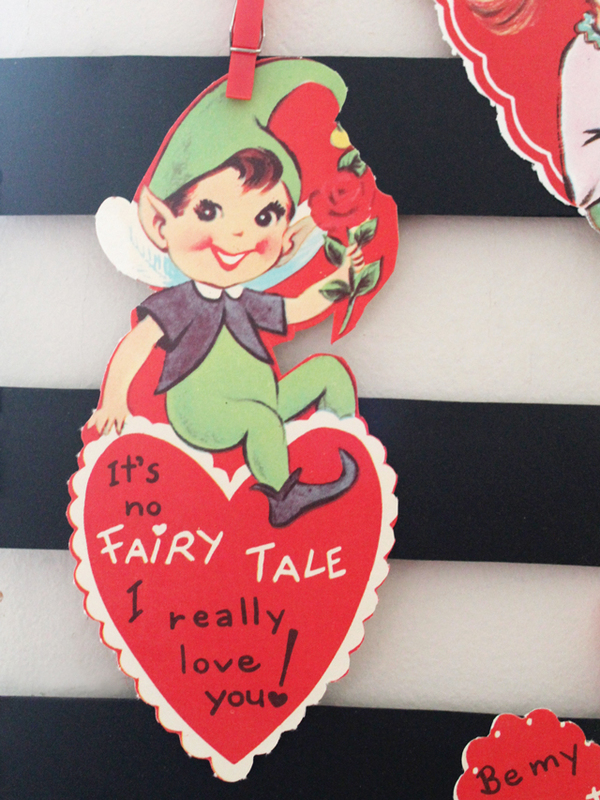 They're part of my collection of Valentines, which I bought on eBay about ten years ago. They are from the early 1960s. I especially love the ones with the elves/fairies. Each year at this time, I get out my collection to look at them, while I'm pulling out the pieces that I will in fact mail to the children in my life -- those would be the duplicates, newer ones, or reproduced-in-recent-years ones (see those in this post). Usually I just admire them, consider selling some, decide otherwise, and then pack them up safely again, to repeat next year. But this year, since I already had the wall hanging thingy still up in our living room, filled with the less-Christmas-y looking Christmas cards, some thank you cards and various photographs that we'd been mailed over the holiday season, I took down what was there and, using some tiny clothes-pegs, hung up this set of Valentines. 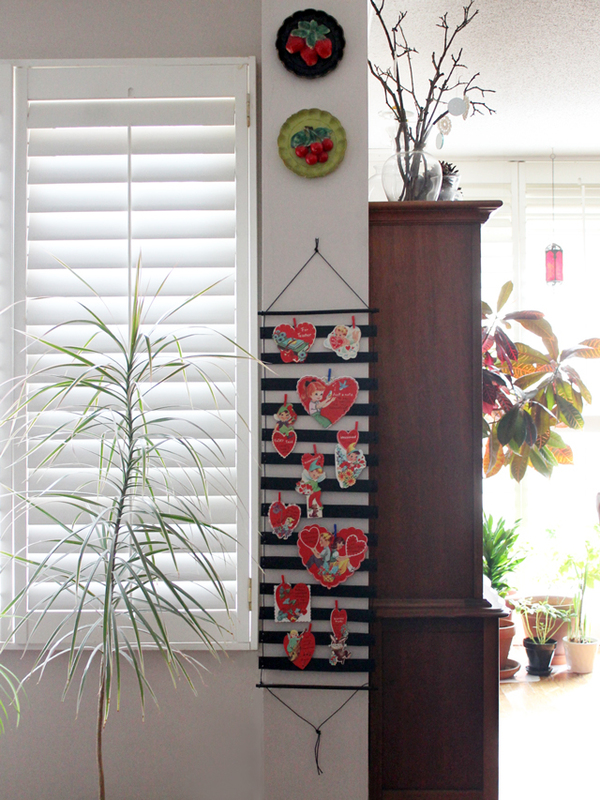 It took me all of two-minutes to change up the display and certainly added a welcome cheerfulness to the room! Thanks very much for taking a look! what a great idea! xO! 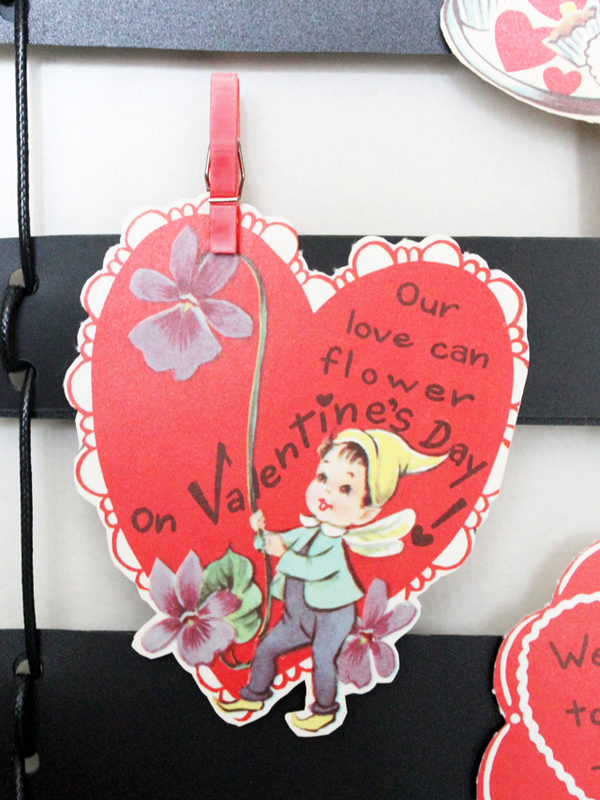 What a great idea, the vintage cards are so pretty but the bold look of the hanger stops them from looking overpoweringly kitsch. 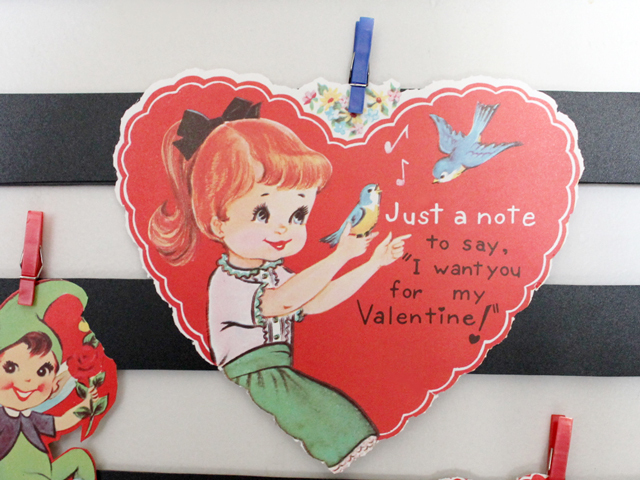 Loved admiring your collection of vintage Valentine’s, they are gems. Got me in the mood for Valentine’s day! Thank you! I love this, such a great idea! 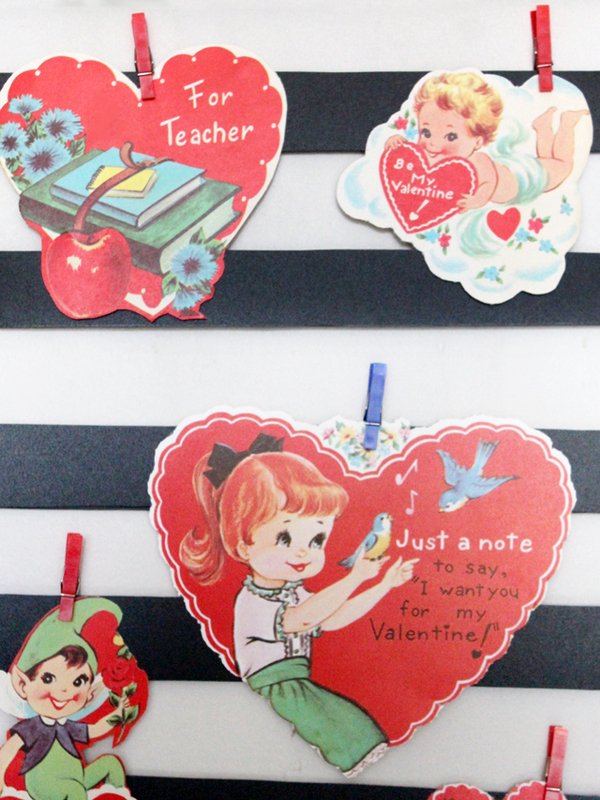 And vintage valentines are the best. 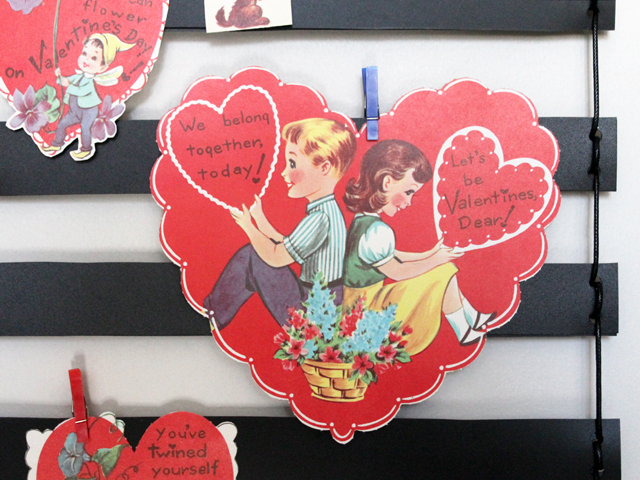 I’ve noticed some reprints of valentines with a vintage feel in recent years, but it’s never quite the same as the real deal. Oh I just love vintage postcards and your display looks wonderful!